The mother of a dead child testified Wednesday that she agreed to starve her toddler son, who refused to say “amen,” to rid him of a demonic spirit that was potentially placed there when her own mother offered the boy up to the devil. Ramkissoon has pleaded guilty to child abuse resulting in death, and expects to receive a 20-year suspended sentence, along with inpatient counseling and five years of probation. Her official sentencing has been repeatedly postponed in anticipation of her testimony Wednesday against three other defendants who are accused of running a religious cult and are charged with murder in 16-month-old Javon’s death. On trial in Baltimore City Circuit Court are accused cult leader Queen Antoinette, 41, her daughter, Trevia Williams, 22, and Marcus Cobbs, 23. Antoinette was developing a religious organization called 1 Mind Ministries and had plans to open a shelter for kids, according to testimony. 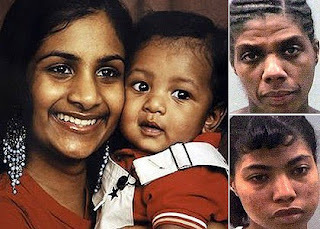 Ramkissoon said Antoinette told her that her son, Javon Thompson, had a ‘’spirit of rebellion” inside him and that denying him food would excise the evil spirit. She said she had no reason to think Antoinette was lying. After Javon died, Antoinette told Ramkissoon to ”nurture him back to life,” and she stayed beside his decomposing body for weeks, even trying to give him water, Ramkissoon said. ”I still believe that my son is coming back,” Ramkissoon said. ”I have no problem saying what really happened because I believe he’s coming back. The former boyfriend of an alleged religious cult leader testified Tuesday that he encouraged the mother of a starving 1-year-old boy to feed the child. Bynum was initially charged along with the other followers in Javon’s death, but prosecutors formally dropped the charges Tuesday. He did not make any deal in exchange for his testimony. Javon’s grandmother, Seeta Khadan-Newton, also testified Tuesday about her efforts to get her daughter and Javon away from the group. After living with the group for just two days, her daughter was “emotionless” and did not return a hug from her, she said. As they cross-examined the witnesses, Antoinette, Williams and Cobbs appeared to take exception at the characterization of their group as a cult. The three defendants are representing themselves. “Where did you come up with or where did you hear that we were a cult?” Antoinette asked Khadan-Newton. Khadan-Newton cited the group’s restrictions on what its members wore and on their movement outside the residence. “In my head, that’s a cult,” she said.